Station at the St. Paul-Outside-the-Walls. 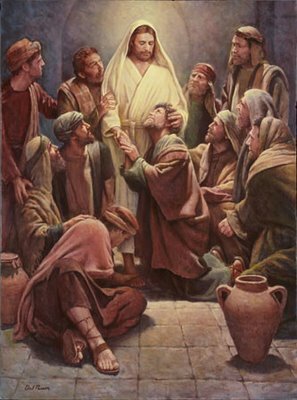 After visiting St. Peter’s, it was fitting that the neophytes should at once be brought to the Doctor of the Gentiles, beside whose tomb they had learned the first rudiments of the new law of the Gospel. Therefore in the Lesson from the Acts of the Apostles chosen for today, it is Paul who announces to the faithful the Resurrection of the Savior as Peter did on Easter Monday. The Gospel from St. Luke describes the first appearance of Jesus to the Apostles. As the Resurrection of Our Lord is the central tenet of the Christian faith, so the Divine Wisdom, in order to take away all excuse for the unbelief of the synagogue, willed that the miracle should be proved beyond all possibility of doubt. In the Prayer with solemn simple words a rule of life is set forth today surpassing the heights to which any mere human mind could rise. The Church prays that God may grant to the baptized realization of all which Baptism ,means inasmuch as it communicates the very life of Jesus Christ Himself. In the Postcommunion the Church teaches that there are two kinds of Communion, the sacramental and the spiritual. By the first we partake actually of the body and blood of Christ; by the second we live by the spirit of the Eucharist, As the sacramental Communion can be received only at certain times and in certain places, Our Lord unites the soul so intimately to Himself in the Holy Eucharist that it lives by His spirit and breathes in unison with His heart. Such, in its highest sense, is spiritual Communion. Lesson from the Acts of the Apostles. In those days, Paul standing up, and with his hand bespeaking silence, said, Men, brethren, children of the stock of Abraham, and whosoever among you fear God, to you the word of this salvation is sent. For they that inhabited Jerusalem, and the rulers thereof, not knowing Him, nor the voices of the prophets which are read every Sabbath, judging Him have fulfilled them; and finding no cause of death in Him, they desired of Pilate that they might kill Him. And when they had fulfilled all things that were written of Him, taking Him down from the tree, they laid Him in a sepulchre. But God raised Him up from the dead the third day; Who was seen for many days by them who came up with Him from Galilee to Jerusalem, who to this present time are His witnesses to the people. And we declare unto you that the promise which was made to our fathers, the same God hath fulfilled to our children, raising up Our Lord Jesus Christ. This is the day which the Lord bath made: let us be glad and rejoice therein. V. (Ps. 106: 2) Let those now speak who have been redeemed by Our Lord: whom He hath redeemed out of the hand of the enemy, and gathered out of the nations. Alleluia, alleluia V. The Lord is risen from the sepulchre, who for us hung upon a tree. The Lord thundered from Heaven, and the Most High gave His voice: and the fountains of water appeared, alleluia. If you be risen with Christ, seek the things that are above, where Christ is sitting at the right hand of God, alleluia; mind the things that are above, alleluia.